Here I am showing way past due outfit photos from Christmas-season celebrations & I saw people talking about SPRING on the internets yesterday... yes, I am excited about tiny floral prints, bare-toes, straw clutches, & perforated leather skirts too, but we are less than 1 month into Winter people! I do have my favorites, however I feel that each one has its place, & I have yet to even break out my cold-weather outerwear on the blog this Winter season yet! So this little bear cub will continue to hibernate down in the Winter season ... embracing my tights, boots, plush scarves, and dark lipstick so that I can appreciate those sunny (& humid!!) days ahead! Are you a 4 season lover? Let's be honest, Fall is my FAVORITE... what's yours? I saw stuff about spring yesterday too! Too soon! I hate winter, and I'm totally wishing for spring already, but I'm also realistic. It's going to be cold in New England until at least mid March, so I may as well embrace it. Love that neon sweater! My favorite season is probably fall too–I just love the felling in the air. And I LOVE that neon sweater. So cute! amen to that!! we are BARELY in winter - no spring yet. you look fab!! Love the vintage jewelry, how special. I love the four seasons and in my opinion it is way too soon to hype spring. Here, in my part of the country, the snow is three feet deep with high temperatures in the 20s. I won't even be able to bare my legs until May! I choose to embrace winter rather than be wishing it away. Loving good in green love!!! Spring can't get here fast enough!! Your legs look about a million miles long. Soooo unfortunately I'm gonna have to hate you today. But you look nice! love the neon green! xO! Gorgeous sweater and skirt! This bright neon looks so fab on you! I think my favorite season is Spring, but I also love Winter because of the holidays. It's really hard to pick a favorite, they all have their goods and bads. 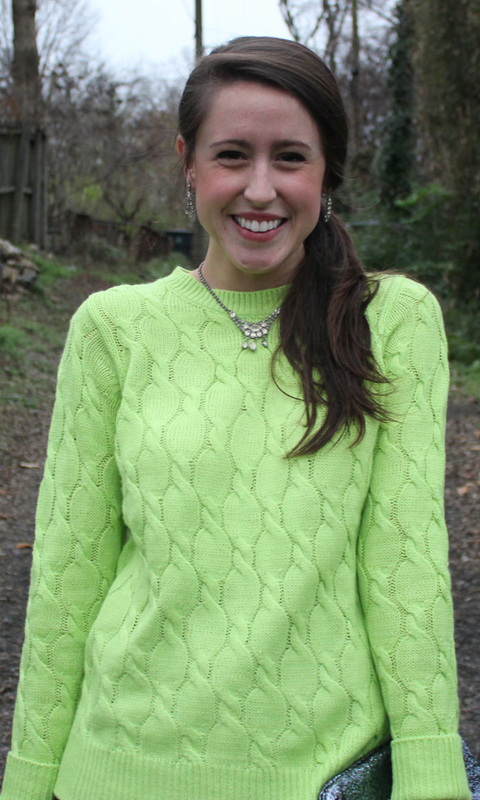 You look gorgeous in your neon sweater, and it's such a fun pop of color on a chilly day. I'm dying for a little warm weather! Spring is my favorite season so once the holidays hit my winter restlessness sets in. Rumor has it, it's supposed to warm up a little in the next few days! Bring on the 40 degrees! You are so adorable, especially in that 2nd picture. Love it. And I love this bright sweater, so cute and fun! I love putting neon and black together!! The sweater is soo cool! Girl, I am with you! I am not over winter in the slightest! Since I live in Houston we have summer time almost year round and it gets so boring wearing shorts over and over again! I will totally embrace my tights, boots, and jackets with ya! Such a cute look and I absolutely love the color of that sweater! I may have to go by a store and check it out! So in love with the color of your sweater! I'm from the Northeast and LOVE having four seasons. We finally had a decent snow storm and I can't stop smiling! Spring has it's place...but not for at least 2-3 months!! And I'm loving this party look! I think this is one of my favorite outfits on you. Love how the green sweater looks with your pretty skirt. Great look! hahaha - good camera angles only, but thank you dear! 40 is warm!? I might not have much room to talk about the subject of being over Winter since they predict temps in the 60s this weekend! love this outfit - i'm such a fan of fun bright colors! I am a HUGE season lover! I lived in CA for a year and cried when it was 80 in December. I love my snow!! I will be ready for spring in Feb/March though. Love the leather skirt with the sweater. I love neon in the winter! Great look. fall is def my favorite season.